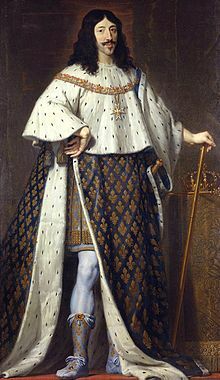 Louis XIII (27 September 1601 – 14 Mey 1643) wis a monarch o the Hoose o Bourbon who ruled as Keeng o Fraunce frae 1610 tae 1643 an Keeng o Navarre (as Louis II) frae 1610 tae 1620, when the croun o Navarre wis merged tae the French croun. Louis Dieudonné o Fraunce, (5 September 1638 – 1 September 1715) Keeng o Fraunce frae 1643 tae 1715. Spoose 1) Maria Theresa o Austrick 2) Madame de Maintenon. Philippe o Fraunce, Duke o Orléans (21 September 1640 – 9 Juin 1701) Mairit 1) Princess Henrietta o Ingland an 2) Elisabeth Charlotte o the Palatinate. 27 September 1601 - 14 Mey 1610 The Dauphin o Fraunce. This page wis last eeditit on 16 Mairch 2019, at 20:24.